You know how much I am passionate about cookies right? I am not having a single week without eating a cookie. 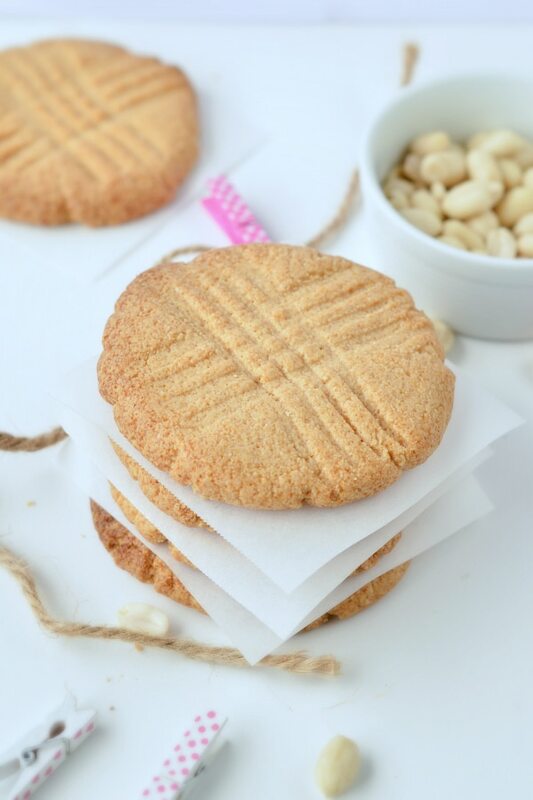 I also have an obssession with nut butter cookies specially peanut butter cookies ! Gosh they are the BEST cookies. My fudgy chocolate avocado cookies with peanut butter are definitely one of my favorite. But today I am sharing something different. No chocolate, no avocado. Peanut butter – always make sure you use unsweetened fresh peanut butter. Old peanut butter jar tend to dry and won’t make as delicious cookies. You can either used salted peanut butter or unsalted peanut butter. If you use salted peanut butter don’t add the extra salt in this recipe. Sugar free crystal sweetener – I used erythritol in this recipe, feel free to replace by monk fruit sugar if preferred, both options are 100% sugar free and no carbs. If you are paleo, coconut sugar will works too – careful the recipe won’t be low carb anymore! Easy Egg free Low Carb Cookies ! 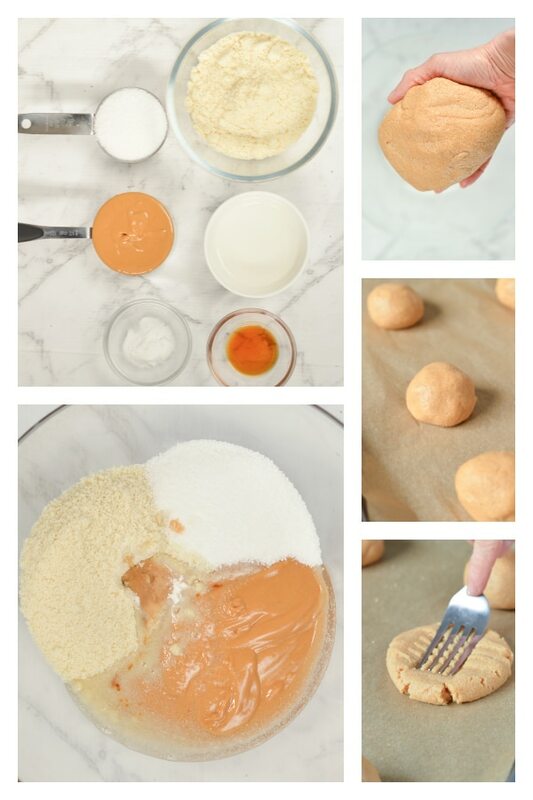 I know you have been used to add eggs into your peanut butter cookies, and I won’t disagree with that technique to make tasty peanut butter cookies. But, my husband is vegan and I love to share my food with him. What is the point to bake if you can’t share right ? So those are egg free peanut butter cookie. It fit both of our diet: Vegan + Low Carb because sharing food with people I love makes me happy! So now you wonder why are those low carb peanut butter cookies MAGIC? Well, compared to regular cookies they will be super SOFT when out of the oven. Like really soft, look under cooked and you will think there is NO way this recipe will harden and works! But it does. 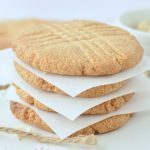 Those peanut butter cookies are simply egg free, and needs more cooling time than baking time to get crunchy and delicious. TIPS : LET THEM COOL DOWN ! So this is the only tips I will give you to succeed with those low carb peanut butter cookies. Follow the baking time, it is 10 minutes not more. The cookies will be very soft and look undercooked and that is what you want! Cool down 10 minutes on the cooking tray. Don’t touch then, start your chrono and wait 10 full minutes. Now they are half hard. Cool down 10 minutes on the cooling rack. Transfer gently each cookies on a cooling rack by sliding a spatula under the cookie. Wait 10 minutes and let’s the magic happens! TADADA! Your cookies are now crunchy, buttery and delicious ! 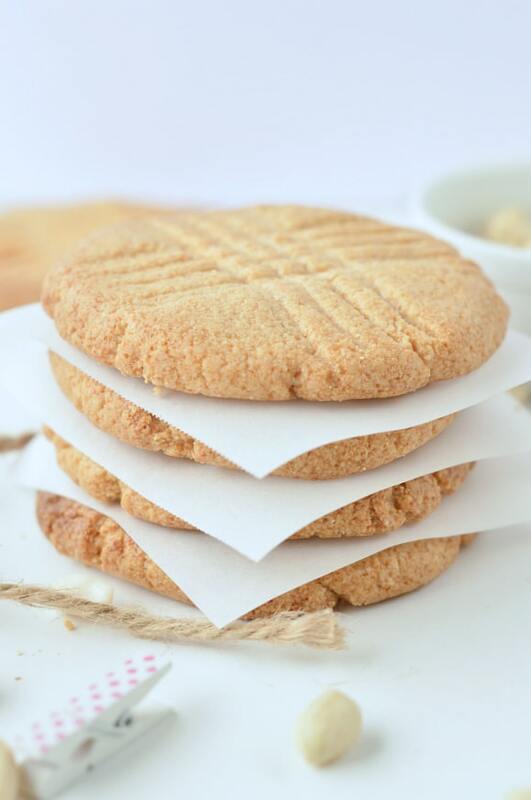 So now, let me know what you think of those easy low carb peanut butter cookies? 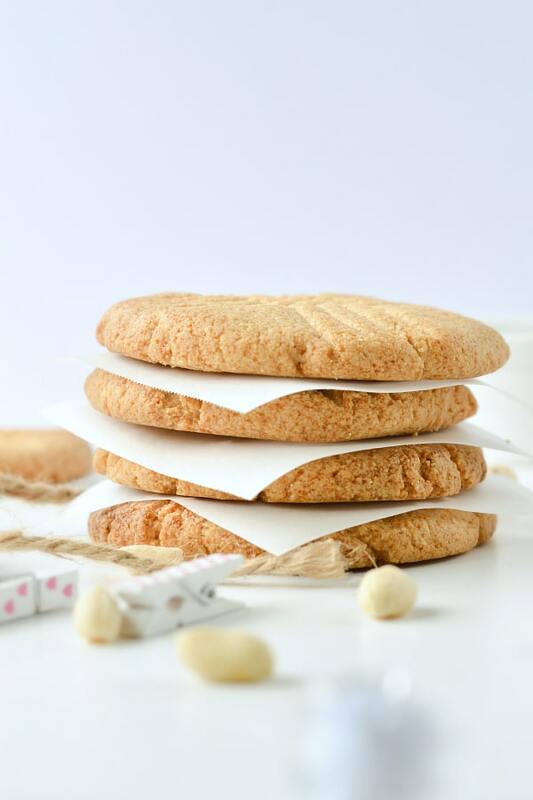 Watch the low carb peanut butter cookies recipe and make them now ! Low carb peanut butter cookies almond flour, coconut oil, sugar free. 100% easy keto gluten free cookies with NO eggs (VEGAN). Preheat oven to fan-bake 350F (180C). Line a cookie sheet with a piece of parchment paper. Set aside. In a large mixing bowl, add all the ingredients: peanut butter, melted coconut oil, erythritol, almond meal, baking soda, salt and vanilla essence. Combine with a spatual until it forms a consistent cookie dough. Divide dough into 8 large cookies (or 12 smaller cookies). Place each cookie ball on the prepared cookie sheet. 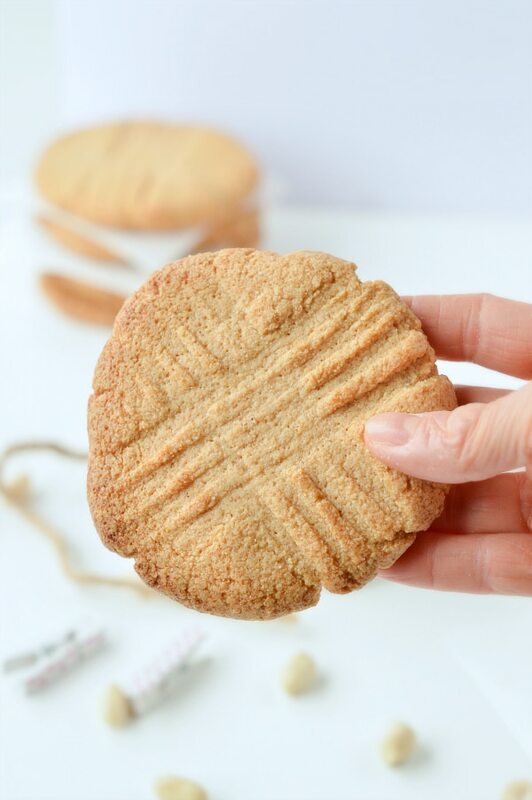 Flatten slightly with your hand palm, then use a fork to flatten more and create a lovely fork print on top of your peanut butter cookies. Those cookies won't expand while baking so no need to leave more than half thumb space between each cookie. Bake 10 minutes or until sides are golden. The cookies looks uncooked, they are VERY soft after baking and that is what you want !!! Remove the tray from the oven and let COOL DOWN for at least 10 minutes on the tray, at room temperature. I know this is difficult to believe they will harden but they will ! Don't touch, let's the magic happens. Now, the cookies are a bit harder, still soft so carefully slide a spatula under each cookie and transfer them one by one, onto a cookie rack to COOL DOWN 10 more minutes. Trust me, it worth waiting! I know it smells good but WAIT for the magic to happen. After those 20 minutes, the cookies are ready to eat but if you love them crunchy wait until they reach room temperature - should not take more than 20 more minutes. They will end up very crunchy, hard and buttery. Store in a cookie jar - glass or metal - for up to 2 weeks. Cool down: Those cookies are mainly made of healthy fat, they don't contains eggs and they need the 2 steps of cool down to get hard and crunchy. Don't skip those steps ! Paleo sweetener: coconut sugar will be a great alternative (not sugar free), use same amount as erythritol. Hi there 🙂 these look divine. Do you think that I could use Stevia liquid instead as the sweetener? That is a tricky question … I did not try myself so hate to say yes when I am unsure. The sugar free crystal sweetener is adding some bulk texture to those cookies so I am worried that liquid stevia will left the dough too soft, you may have to balance with extra almond flour to get the right texture. Let me know if you try something. Thanks for reading the blog and trying some of my sugar free treat recipes. XOXO Carine. Hi can you use xylitol ? Sure, any sugar free sweetener are working well in this recipe. I don’t really like Xylitol in high amount because I found it has a minty aftertaste but if it is your favorite sugar free sweetener go for it! Enjoy the recipe. XOXO Carine. Xylitol raises your blood sugar 70% as much as sugar, so if you are keto, I wouldn’t advise it. Golden Monkfruit is my favorite in this recipe. I never use or recommend Xylitol in my recipes as I know it has a high glycaemic index. I always recommend Monk fruit crystal sweetener or erythritol, both don’t raise blood sugar level and they are natural Enjoy the recipe. XOXO Carine. I agree, it is always better with chocolate chips ! Thanks so much for the lovely comment and for trying my recipes. Enjoy the blog. XOXO Carine. Peanut butter flavor was almost non existent. Followed recipe with just two tweaks. Used butter versus coconut oil and added an egg for a binder. Suggestions?? Hello, this recipe intend to be vegan, so you shouldn’t add an egg at all, it is not required to bind the ingredients. Also butter and eggs have very empowering flavors compared to unrefined coconut oil which has no coconut flavor. I guess that is why your adaptation changed the cookie flavor so much. 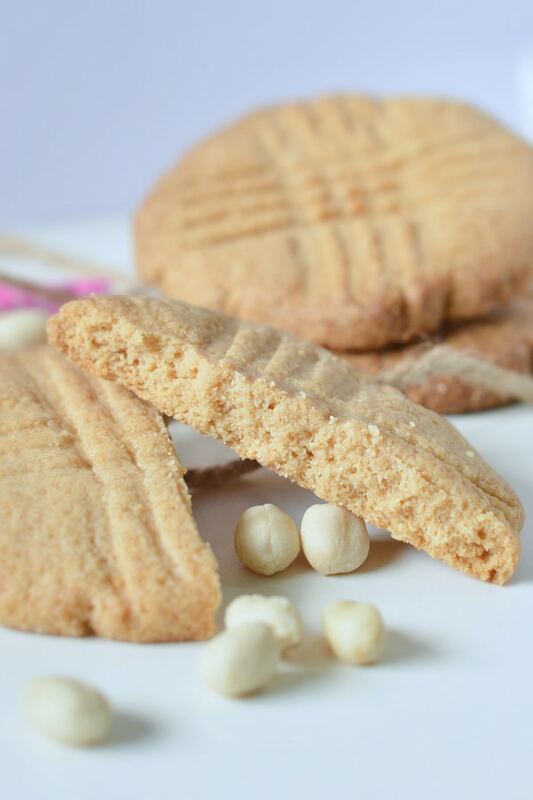 Try to follow the recipe as describe on the blog and I am sure you will love the peanut butter flavor of those cookies. Enjoy the recipes. XOXO Carine. Well, apologies for my previous comment. Followed recipe to the mark. Results? Amazing! What can I say, I’m a typical man. Directions are only a guideline. This is now a staple sweet for us. Peanut butter flavor came through great!! No problem! I admire a man cooking, I wish my husband bake too. haha. Thank you so much for trying the recipe again and sharing such a lovely feedback . Have a lovely time on the blog. Enjoy the cookies. XOXO Carine. I made this according to the recipe and the cookies tasted great, but were very crumbly. I’m thinking about adding a binder, but instead of an egg, I was thinking about a flax seed/water mixture. My thought is that it will help, but shouldn’t change the flavor profile. Thoughts? Did you cool down the cookies for 20 minutes as mentioned? I did not try adding a flax egg but it should help with the texture if you encounter some issue. It should not change the flavor. Enjoy the recipe . XOXO Carine. You should not use sugar, this is a sugar free recipe and it may be the reason why this doesn’t work. I don’t eat sugar so I am not sure how much you should use but it explain why the recipe is not working. XOXO Carine. I made your peanut butter cookies last night and they are amazing. I really appreciate your step by step details. Working with new flours can be difficult, so I appreciate the tips and tricks. I’m excited to try your other Keto recipes. Hi Cheryl! Thank you so much for this lovely message. I do take extra care to describe every little steps because as you said, baking with low carb flour is tricky! I hope you will try even more recipes on the blog. Enjoy my little place. XOXO Carine. 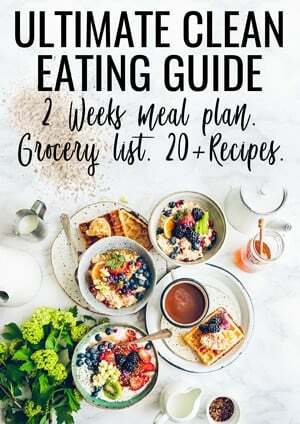 Thank you for all these wonderful recipes that are helping me through gestational diabetes. Question- some of the nutrition panels are not showing up on some recipes like this one. Is this a problem on my side or is the recipe missing it? And can xylitol be used instead? You are probably using an ad blocker on your device and that is why it may not show. I can see it properly on my side, make sure you also scroll down after the recipe box to see it. Yes, any kind of sugar free crystal sweetener works, use your favorite one. XOXO Carine. Hi, getting ready to make these. Hubby is type2 diabetic and likes crispy pb cookies. By fan bake, do you mean convect? Thanks! Yes fan bake is convection ! I hope you guys like it. Enjoy the sugar free recipes on the blog. XOXO Carine. Do you have any suggestions on how to alter the recipe to incorporate eggs and butter? I saw in a previous comment that you mentioned the eggs and butter can overpower the peanut butter taste if the proper quantities are not used. I understand this is intended to be a vegan recipe but I am just trying to go low carb at the time. Hi! I did not made those cookies with eggs or butter but keep in mind that those are keto cookies! They may not have butter or eggs but they have all the fat, few carbs and perfect for the low carb diet. Of course, they are also vegan but that is just a plus. It will be a very different recipes if you alter it that way, you will probably don’t even need almond flour at all! I am so sorry I can’t provide much more options for you. I hope this answer your questions. Enjoy the low carb recipes on the blog. XOXO Carine. The flovar of these cookies were amazing but unfortunately they were so fragile I couldn’t even pick one up without it crumbling to pieces. I followed the cooking and cooling times exactly as you stated. Would adding an egg help them hold together better? Thanks! They are fragile but they firm up very well if you use the exact same ingredients and follow the cooling steps. May I ask if you change any ingredient? I did not try the recipe with an egg as my husband is vegan and it is what I make for him very often. It always come out great in my kitchen so I am very sorry to hear you had trouble with this recipe and I would love to help you out. Let me know, XOXO Carine. is it possible to substitute the almond flour with oat flour or any other kind? Hello! I did not try this option, I know by experience that sub almond flour for oat flour works really well but as I did not try I don’t like to say yes. Let me know if you give this a go! It is a healthy alternative as well. XOXO Carine. Just made these, they have been out of the oven for 15 minutes and half of them ate gone. Hands down, the best peanut butter cookies I’ve ever made. Making more batches now! Thank you. Aamzing! I love to read that. Thanks so much for trying my recipes. Have a lovely time on the blog. XOXO Carine. I should work yes! Enjoy the recipe. XOXO Carine. If you were going to use regular sugar, how much would you put in? Same amount? I never use regular sugar, I guess the same amount will work but the cookie will be crispier as regular sugar melt into a caramel in baking. Enjoy the cookies, XOXO Carine. I am bad at math and trying to figure out the net carbs when you make 12 cookies instead of 8 (as you said was an option). Can anyone help me with the math – is how many net carbs in each cookie if you make 12? Thanks and can I just say, YUM!! That is no problem! If you make 12 cookies the net carbs per cookie using the similar ingredient will be 2.9 g. Enjoy the recipe. XOXO Carine. I can’t wait to try these! PB cookies are one of my favs! Question about the nutrition info. Are the 2 sugars shown in the nutrition box because of the sweetener? Or are they from another ingredient? The sugar simply comes from the almond meal. Almond has 3.9 g of natural sugar per 100 g. Most food even the lowest carb vegetable have tiny bit of sugar it does not means this is not keto friendly! Almond meal is one of the lowest carb flour to bake so you are safe here! Enjoy the cookies, XOXO Carine. I have been doing a low carb lifestyle off and on for about 5 years and these are HANDS DOWN the BEST low carb cookies I have ever made. Thank you so much. I am looking forward to trying more of your recipes. I found you today because I am going to try to cut back on animal fats due and use more vegetable fats in my low carb/keto plan because I think that I am getting too much protein and it is causing me to stall. I dont want to go full-on vegan, but I will cut out where I can. Thanks again! I am SO glad you find me ! I am passionate with low carb baking and with a vegan husband at home I am inspired to create more and more keto friendly recipes with no animal fat or eggs. Enjoy the blog recipes and thank YOU for trying my recipes. XOXO Carine. Thank you very much for this lovely comment, that is all I love to read. Enjoy the blog recipes, XOXO Carine. I am very sorry to read your comment about the peanut butter cookie. They hold perfectly together if you don’t swap any ingredients and don’t touch them after being baked. Follow the two cooling steps and it will work like magic. That is the secret of this recipe. You should bot had an egg at any time. If the dough was too powder like, you may have miss some liquid or did not properly measure them explaining why the batter was dry. I made this recipe more than 10 times and if you read all the comments it is a great success. The cooling time is what makes them hold as stated in the recipe. I hope you take some time to try it again. Enjoy the blog recipes. XOXO Carine. I am so glad to hear that! The choc chips addition sounds amazing! Enjoy the recipes on the blog. XOXO Carine. Can I substitute coconut oil please i am allergic to it ? I didn’t try a different oil in this recipe so I am not sure how it will work, may be butter or dairy free butter but I am worried that the cookies won’t hold and stay crumbly. Let me know if you try something. Enjoy the recipes on the blog, XOXO Carine. Just made a batch. I have a very sweet tooth and my problem with keto is falling down the wagon when my period comes. I am ready now! They smell awesome and I am sure they turned up delicious!!!! I am so glad you love them too! Enjoy the low carb recipes on the blog, XOXO Carine. Thank you for the recipe. I wish to try it, but I do not have a convection oven/fan oven. Do you know what temperature and cooking time I would use for a regular oven? Any oven is perfect, convection or not the recipe will work well. Enjoy Simone. XOXO Carine. I have to to say these are my fave low-carb pb cookies. It’s hot in my kitchen (presently making 3 batches for a bake sae at my daughter’s school!) so they didn’t cool enough and were a crumbly if I held them wrong (they are indeed delicate). But the flavor is amazing, nice buttery flavor like regular pb cookies, and they look great. I’m going to pop the next batch in the fridge a few minutes since my oven makes my kitchen feel luke summer! I also used powdered Stevia instead and only used 1/4 cup, and I like the flavor just fine (if anyone is interested in a stevia substitute; it’s hard to find any other substitutes in my area). All in all, thank you for putting this recipe out for the world! I’ve been trying gluten-free and sugar-free recipes ALL day, and all were flops except this one! <3 Thank you so much! Thank you for the lovely comment! I am so glad you enjoy the cookie too. XOXO Carine. I am so happy to read your comment! Enjoy the low carb recipes on the blog. XOXO Carine. Bravo! This is THE BEST low-carb PB cookie recipe I’ve found! Thank you and I’ll be making these again soon. Oh thank you SO much for this lovely comment! I am glad you like them. Enjoy the blog recipes. XOXO Carine. OMG! You are so creative I love what you made with this simple recipe and hey! why not trying that pie crust afterall, great idea 🙂 Thanks SO much for sharing your ideas and your lovely feedback. Enjoy the low carb recipes on the blog. XOXO Carine.